Below is everything you need to know about being a member of the 2019 “Pride of Arizona” Marching Band. We are very excited about the upcoming season! 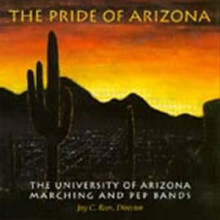 The POA is a highly visible organization that represents not only the University of Arizona at football games, but also the University of Arizona Athletics Department and the Fred Fox School of Music. Built on musical and visual excellence, the nationally recognized POA marching band offers its members the opportunity to perform on a national stage at the highest possible level. We want the “Pride” to be a significant life experience that you will remember forever! * Marching Band is a University Course. Everyone must be registered for band, including auxiliaries. We cannot issue you a uniform until you are registered. If you have a problem registering through UAccess, you can add the class with a Drop/Add Form. If you are a Pima Community College student, you can apply as a Non-Degree Seeking Student through the Office of Admissions website. Do not delay – be registered before Band Camp begins on August 17, 2019! ** Everyone must complete the Student Profile form, including auxiliaries. This form is critical for our band to operate effectively. Your attendance and participation in the dates and times listed on the Fall Schedule is mandatory. Reserve these dates on your calendar now. You will receive a complete detailed schedule of band events for the academic year during Band Camp. In addition to our regular rehearsals (MWF 3:00pm – 5:45pm, and some Saturdays 8:00am – 12:30pm), the “Pride” is also actively involved on the remaining dates. Please do not schedule anything else during these times. Our pre-season rehearsals will begin on Saturday, August 17, and continue through Friday, August 23. During this time we will learn pre-game and at least Part 1 of our primary halftime show. Band Camp is a week filled with difficult challenges, amazing growth, and character building as you all work to become the “Pride of Arizona” Marching Band. We strongly recommend that you arrive for rehearsals in good physical shape and wear shorts, comfortable athletic shoes (no sandals), and a hat for rehearsal. Temperatures in Tucson are in the low 100’s in mid-August. Plenty of water and sun-block are a must. We encourage you to bring your own supply including a gallon water jug with your name on it. You will also be responsible for providing your own meals. Keep practicing this summer so that you can arrive in shape ready to play, dance, do guard work, and twirl with everything you have. We are looking forward to creating the finest possible experience for you. Auditions will begin promptly at 9:00 AM on Saturday the 17th, the first day of Band Camp. These auditions are mandatory. You will not have a spot in the first show if you are not at the audition. These auditions are merely for part placement and are not meant to be stressful. Your playing will also be a factor in determining part-time or alternate status. So, keep practicing throughout the summer. Band Camp will be here before you know it! If you play baritone saxophone, mellophone, baritone or sousaphone, you may rent an instrument from the Fred Fox School of Music. There is a $75 rental fee plus a $75 deposit for each instrument. Once you have completed the Student Profile Form and have indicated what instrument you play, your Bursar account will be charged $150. Your deposit fee ($75) will be credited back to your Bursar account when you return your instrument on-time and in good condition. Instruments will be checked out upon arrival for Band Camp. Bring your CatCard! Flute players must play a piccolo. Clarinets and Saxophones will play on proper reeds (no plastic or synthetic reeds). If you are playing a Fred Fox School of Music supplied instrument, you will need to purchase/provide your own mouthpiece. See below for the model of mouthpiece we require. Shirts are TBD at this time. You will also need to purchase a UA Drill Binder with clear sheets included (approx. $14). Note: Tubas will purchase just the rings and clear sheets, not the binder. This year, the UA BookStore will bring a credit card reader to take payment for the Binders and Tuba packs. Please keep in mind, you may still need a check to rent an instrument if you’re not a full-time student. These items are TBD at this time. All new members – if you feel you may need a uniform that is larger or smaller than an average size, please call or e-mail us with your jacket and waist size right away. Otherwise, you will fill out a separate form at uniform checkout during band camp. Parking permits for Band Camp and throughout the regular season will be available for $102. This permit is an option offered for your convenience and is NOT mandatory. We advise if you can park elsewhere and walk to rehearsal that you do so. Permits will be available for purchase at the Parking & Transportation office beginning August 1st. If you are living in a UA dorm this Fall, you will be able to check into your room early on Friday, August 16. If you have not done so already, be sure to submit your request for early housing on the Housing Application Form and pay the $165 non-refundable application fee to Residence Life. Everyone must be registered for marching band, including auxiliaries. Everyone must complete the Student Profile Form, including auxiliaries. Musicians will receive their music in July. If you do not, please call the Band Office (520-621-1683). Practice Rooms are available on a first-come, first-served basis. If you need one, please contact the Fred Fox School of Music at 520-621-3065 for more information. Flute players – find a piccolo! Clarinets and Saxophones – purchase and use proper reeds! Be prepared for the hot weather. Bring athletic shoes – do not march in sandals, boots, ballet slippers, etc. Note: We can only accept personal checks or money orders for the in-person purchases. Please plan accordingly and come prepared.